Find out how you can share your God given gifts, grow in faith, and serve your neighbor through ministries at GSLC. We look forward to meeting you! Learn a bit about visiting GSLC. Sign up for updates and follow us on social media. Here is your opportunity to donate to the mission and ministry of GSLC or learn more about how GSLC might be able to offer support and encouragement during your own time of need. Good Shepherd Members can log into our online communication site, Realm, for the most complete list of announcements and events. 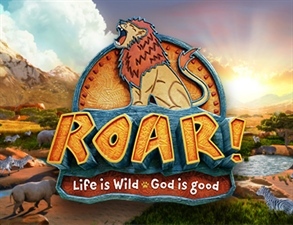 Join us for the Easter story, a treat, and of course the hunt! Open to ages from 0 through 3rd grade, this event is open to the public. We hope to see you on April 20th at 4 pm in the Fellowship Hall. 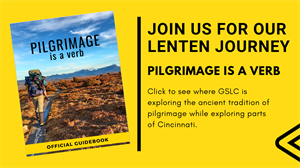 While we are not going on a long journey to a foreign land on our pilgrimage this Lent, we are planning to walk more around our fair city. The exercise itself is good for our bodies and minds, of course, but the idea of walking with intention, of walking in our city, aware that God is walking with us is also good for our souls. Each week in your Journey guide book there will be a suggested location to take a walk. You could also find similar places nearer to your home if transportation is an issue. Check out govibrant.org for suggestions of walks all around Cincinnati and to participate in their Million Step Challenge. breaths or it was a several-hour odyssey. Perhaps it would be helpful to you to make notes directly on this map of how you’re PUTTING DOWN, LOOKING UP, GOING OUT, TURNING ASIDE, and TAKING UP as you walk. What do you call a group of 15-20 guys sitting in a bar talking about God? Why, Pub Theology of course! As part of our men's ministry (Men Doing Life), Pub Theology is a place for fellowship, food, discussion, and brews. We hope to see you on the 3rd Thursday of each month!